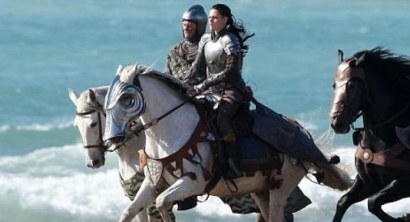 Kristen Stewart on set of "Show White"
The 21-year-old actress was faced with having to saddle up on the set of new movie 'Snow White and the Huntsman' - in which she plays the titular beauty - and she admits she struggled to face up to the task because she once "fell off" a horse and broke a bone. According to the Daily Star newspaper, she said: "I was shaking like a leaf when saddling up. Riding horses terrifies me. I've felt that way ever since I fell off a horse when I was nine and broke my elbow." It is not the first time Kristen - who is dating her 'Twilight' co-star Robert Pattinson - has confessed to being nervous about something she has had to do for a film role. The star had to learn how to strip for movie 'Welcome to the Rileys', but found much of the preparation she did went unused. She said: "You don't actually see me strip which I suppose is a good thing as I was initially nervous about that. Now it's kind of annoying because I learned how to do it but you don't see any of it. But it's probably for the best."